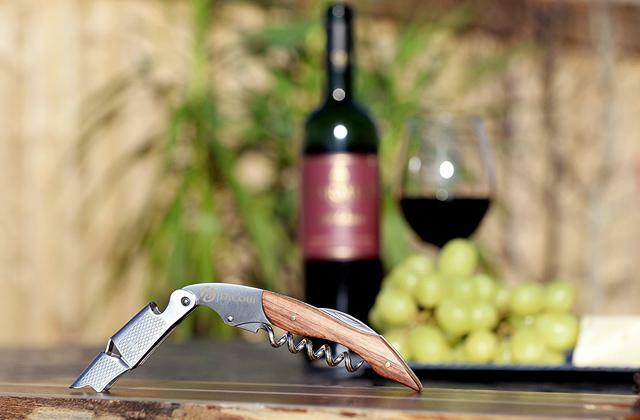 Trizor XV® Edge technology will make a top-grade, long-lasting and sharp edge for any knife. The patented spring guides will help you sharpen your cutting tools accurately. The sharpener is unfit for very thick European cleavers. 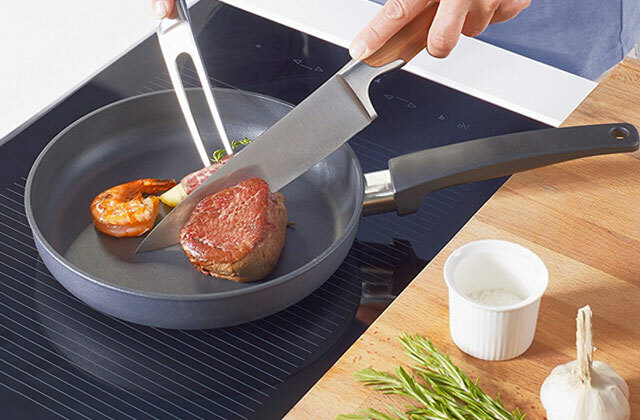 It's a perfect choice for every cook who wishes to sharpen a knife within a minute. No rubbish after sharpening - the magnetized cover will catch all the filings. Thanks to replaceable abrasive materials, this sharpener will serve you for a long time, making your knives truly sharp. Sharpening of steel knives takes longer time than of conventional ones. Thanks to the adjustable sharpening angle, this knife sharpener is a good choice for those who have various knives like kitchen knives, hunting knives, etc. The built-in "stop" prevents the damage of a blade by stopping the sharpener when you apply too much pressure. The sharpener is a bit noisy when in use. This electric knife sharpener will be an excellent alternative for beginners as it sets the sharpening angle automatically. You need to make just 2-3 pulls through each groove to sharpen your knife. Patented in the USA, the design of this knife sharpener will allow you to sharpen knives or/and any other cutting tools with one hand. No polishing and honing options. This compact manual knife sharpener will minimize your effort and let you sharpen the dullest knives and other cutting tools within just 60 seconds. 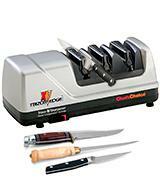 Convenient handles and easy-to-read stone identifications allow you to change the sharpening stages easily. The honing solution will protect the sharpening surface of the stones. 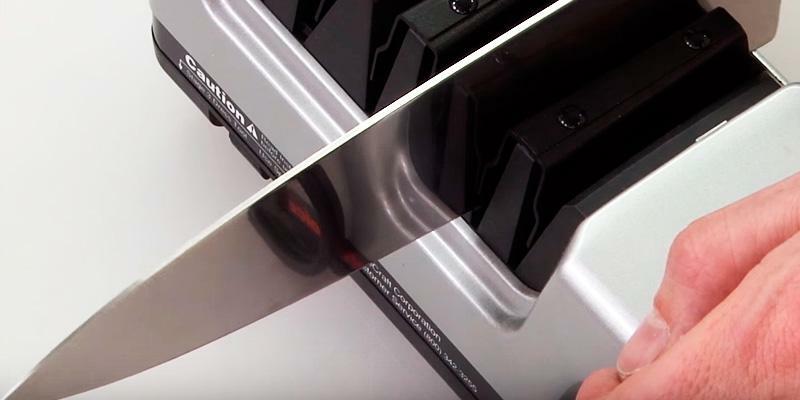 Those who have never used a knife sharpener before might need some time to get used to its mechanism. The stones of this classical knife sharpener will let you whet all the knives pursuant to their purposes. A good choice for a cutting edge renovation or a blade whet. When it comes to a knife sharpening, we can make it either sharp and fragile or rough and durable. It's self-evident that the second option won't let you cut food into fine slices. 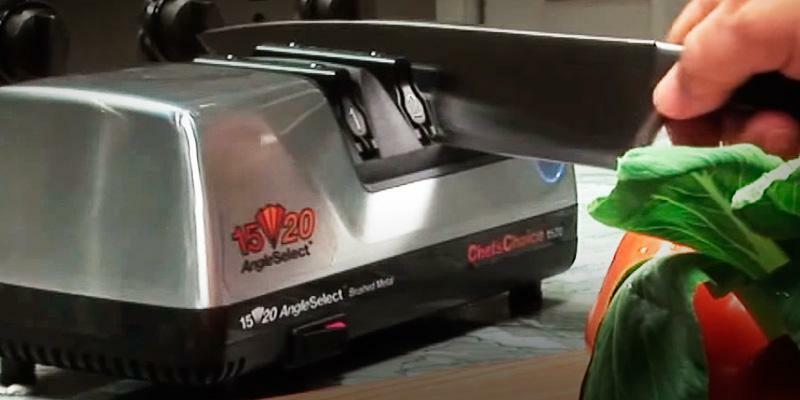 Having bought Chef’sChoice® Trizor XV® Sharpener EdgeSelect®, you'll be able to make any kitchen knife amazingly edged. This is provided mainly by the patented Trizor XV EdgeSelect® technology that creates a 15-degree triple-bevel edge, making your knives similar to the top Asian knives famous worldwide for their ultimate sharpness and durability. A lot of abrasive materials are used for sharpening, but none of them can be compared with 100-percent diamond abrasives of Trizor XV EdgeSelect Electric Knife Sharpener. Such material ensures an excellent result both at the first and second sharpening stage; during the beveling and sharpening. The third sharpening stage involves the patented flexible stropping disks for final honing and creating a smooth and ultra-sharp edge. The third stage is also good for re-sharpening of slightly dulled knives and renovation of serrated blades. Meanwhile, the Chef's Choice 120 Diamond Hone 3-Stage Professional Knife Sharpener will be suitable for thick butcher knives and heavy hunting knives with concave blade faces. Anyway, Chef's Choice did its best to make you happy with your knives. 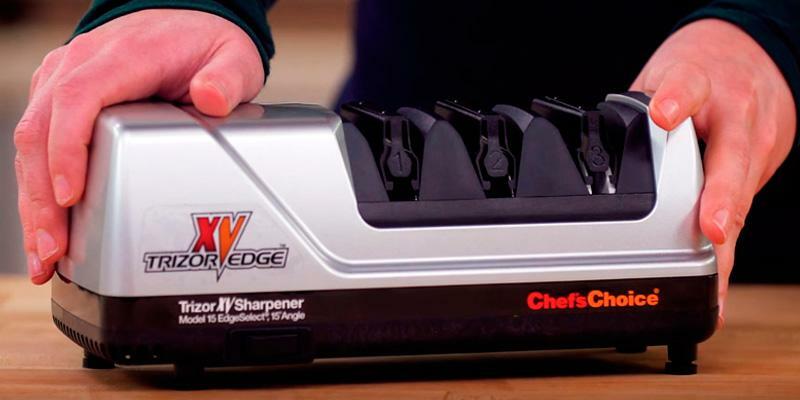 America’s Test Kitchen Video Review confirms that this knife sharpener is truly the best. 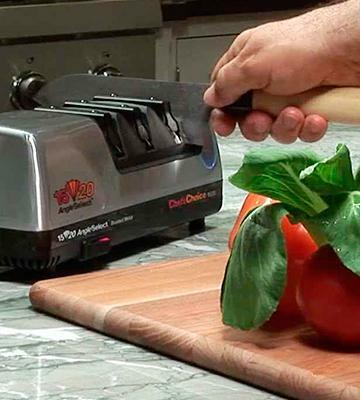 Chef's Choice has made this sharpener with convenience in mind. 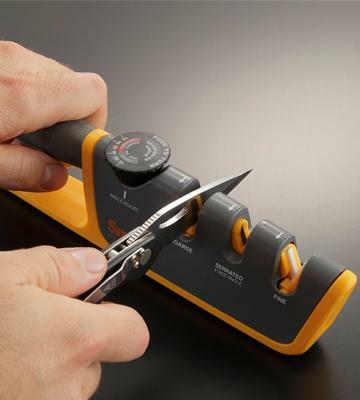 Owing to the flexible guides, a precise and smooth sharpening of your knives will be super easy! Pull your knife through each of the sharpener's grooves a few times and get it wonderfully honed. The cleaning of sharpener is also effortless. 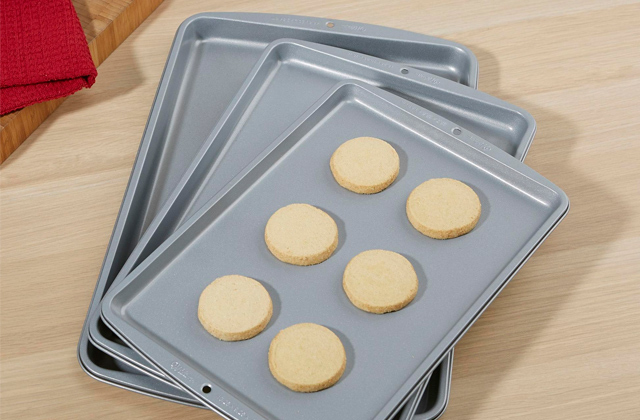 If the sharpening disks become dirty or glazed after use, just clean them with a special built-in diamond dressing system. The sharpener is also very easy to clean from metal dust and filings; just remove the cover from the unit's bottom and brush the dust off from the cover's magnet. That's all! A knife set will be an ideal addition to this knife sharpener. I love this sharpener. I own a mix of moderate to very expensive knives with different bevels. I have used the first stage of this 3-stage sharpener to convert my Western cutlery to 15 degrees rot match my Asian knives. No blade damage there with the higher-quality steel -- just a wicked-sharp knife. Great attention to detail features include a trap door to remove shavings from internal compartment, and the ability to renew/refresh the stropping/polishing discs when needed (not very often). 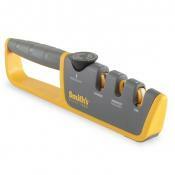 Smith's 50264 is referred to the manual knife sharpeners. 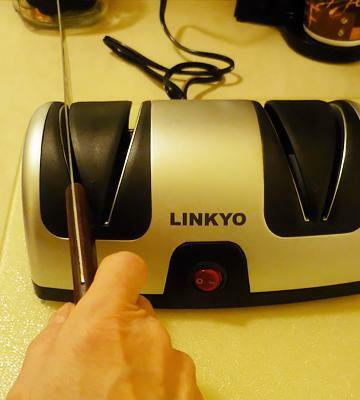 Probably, you will need to spend some time to master this knife sharpener. Still, the detailed manual and user-friendly design will make the use easy after a while. Thanks to the soft handle, this knife sharpener will be convenient to hold, and rubber feet will provide excellent cohesion between the base and your countertop. If the abrasive components of Smith's 50264 are worn out, you can purchase the new ones. Replacement of the wheels is easy and can be done with a screwdriver only. 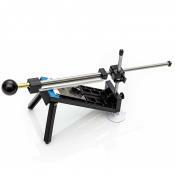 The adjustable sharpening angle expands the applicability of Smith's 50264. Thanks to this option, you will be able not only to sharpen various knives (table knives, penknives, hunting and camping knives) but also extend their life. The convenient adjusting knob with distinctive marks will help you choose the right sharpening angle. But the best way to sharpen your knife is to keep the angle provided by the manufacturer. If you need to whet the curved knife, you may choose the preset angle for curved blades. 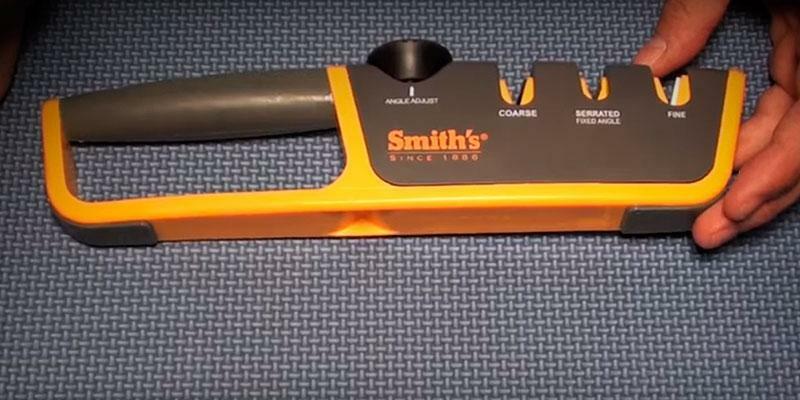 Smith's 50264 will be able to sharpen conventional knives with both straight and serrated blades. 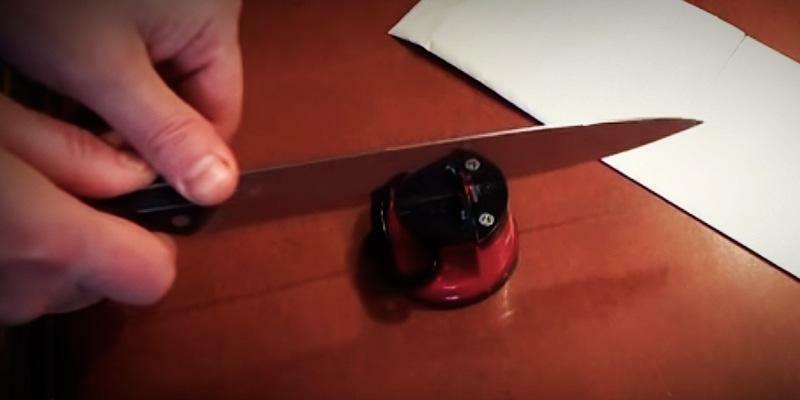 This knife sharpener is designed for restoration of even badly damaged blades. The first stage includes the rough sharpening with the carbide: a thin layer of metal is removed and the shape of the blade is restored. At the second stage, the cutting edge is polished and honed with the ceramic abrasive. If your knives are just a bit blunt, honing and polishing will be enough. The adjustable sharpening angles makes it a very versatile sharpener. 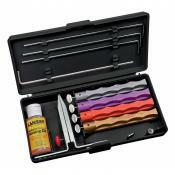 Much easier to use than the kits with multiple stones and clamp system which holds the knife at the desired angle. Does a great job of keeping a nice edge on kitchen knives and my fillet knives. Also works on serrated blades. The adjustment feature is smooth and works well however i was unimpressed with some of the results. 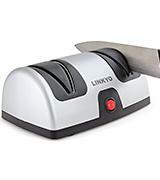 Electric knife sharpener LINKYO is an excellent choice for housemakers who hate tricky operation. The body includes two grooves for 2-stage sharpening. The abrasive discs are located in the grooves, and they sharpen your knives while rotating. 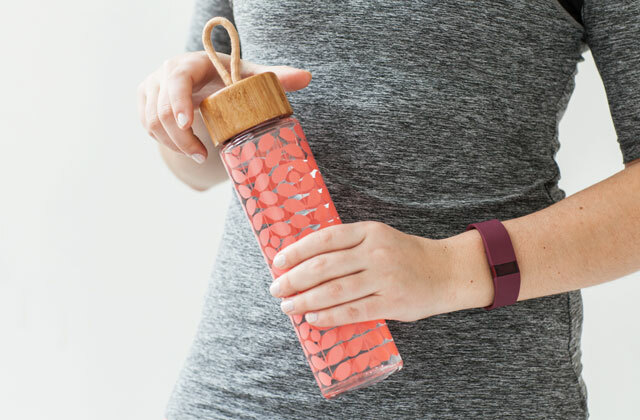 The suction cup provides the stability of the device. One more advantage is a built-in "stop". How does it actually work? 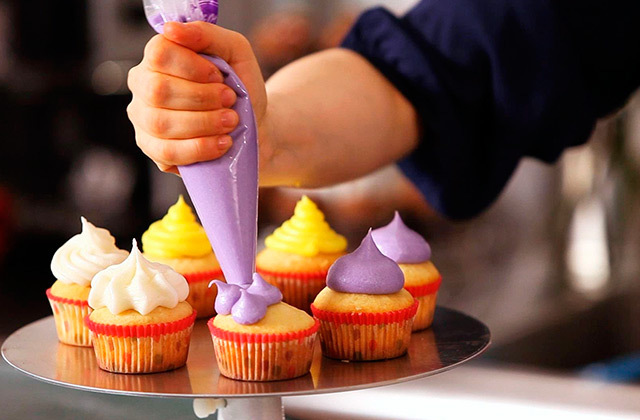 If you apply too much pressure on a knife, the safety system will stop rotation of discs. Moreover, the metal chips are collected inside the sharpener. So, having pulled two plugs out of the sharpener base, you can easily remove them after use. The automatic adjustment of the sharpening angle highlights its extra convenience. The most appropriate sharpening angles were provided by the manufacturer, and you just need to follow the manual. It is enough to pull your knife through the sharpener several times without pressing too much and make your knife truly sharp. Amazing! 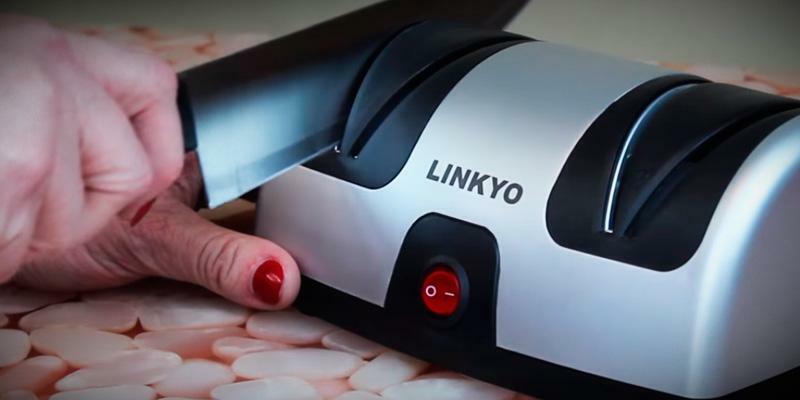 LINKYO Electric Knife Sharpener is an ideal option for those who wish to make sharpening easy. 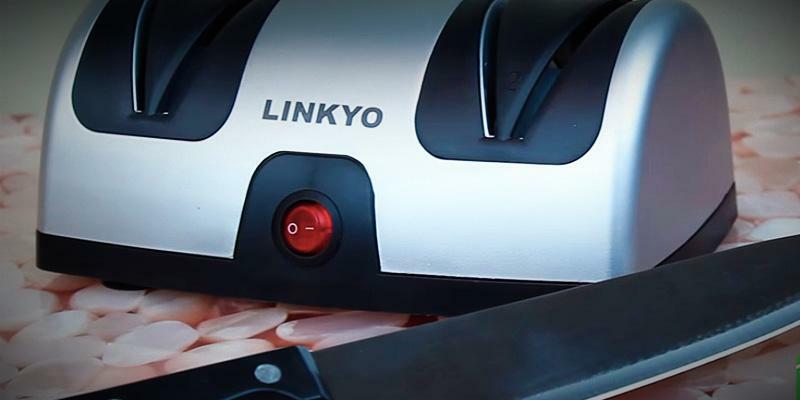 This knife sharpener will allow you to keep all your knives in tip-top condition. Still, you should consider that this knife sharpener is designed solely for metal knives with straight blades. At the first stage of sharpening, the angle of the knife blade is rejuvenated and all damages are eliminated. The second stage involves the blade honing and polishing. You should pull your knife through each groove equally to provide the high-quality sharpening. This knife sharpener was patented in the USA and is referred to manual (mechanical) knife sharpeners. However, it looks a bit differently than other knife sharpeners. The main benefit is that you won't have to hold this sharpener in order to whet your knife. Furthermore, thanks to the vacuum suction cup, this sharpener will be steady when in use. As a result, you will have both hands free. Wow! Very convenient. 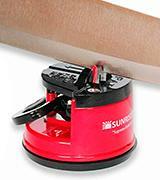 SunrisePro Knife Sharpener contains the abrasive materials located at the perfect angle to provide the utmost sharpness. It means that this tool can sharpen the straight blades of various cutlery at the prefixed angle. Moreover, this knife sharpener will allow you to take care not only of the kitchen gear but also of hunting or camping knives. But its abilities are not limited to knife sharpening only! 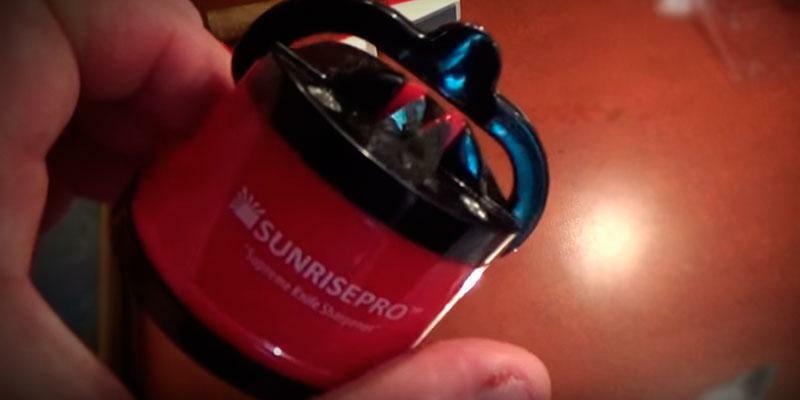 SunrisePro Sharpener can cope even with the blades of pruning shears and blenders. This hand knife sharpener will whet any knife, despite the only sharpening stage. 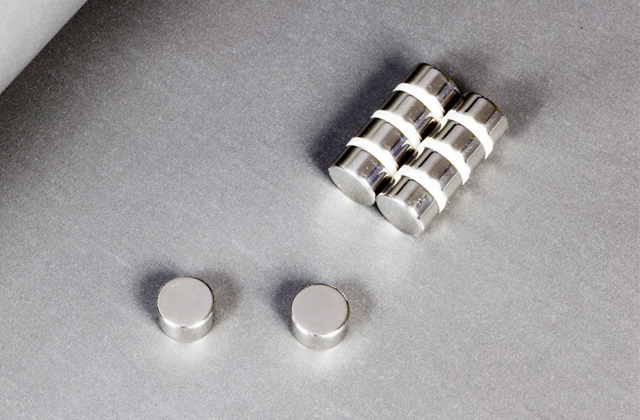 The sharpening stones made of tungsten carbide are long-lasting. So, you will be able to use this kitchen knife sharpener for a long time. When you whet a knife, the whetstones remove a fine layer of metal from the blade, eliminating the burrs. Hence, the knife blade will be smooth, sharp, and beaming. Consequently, your knife will look like a brand new one. 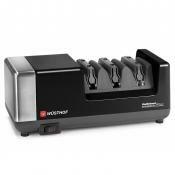 This whetstone knife sharpener consists of the one-piece rotating triangle block installed on the plastic molded base. The block contains three whetstones of different grits for multistage sharpening. 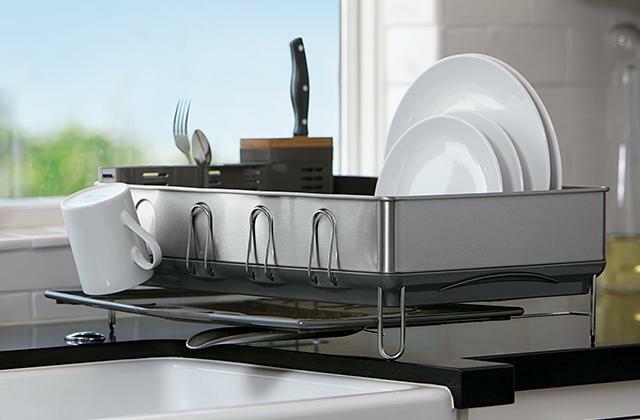 In addition, the rubber feet will provide the steady placement on any countertop. 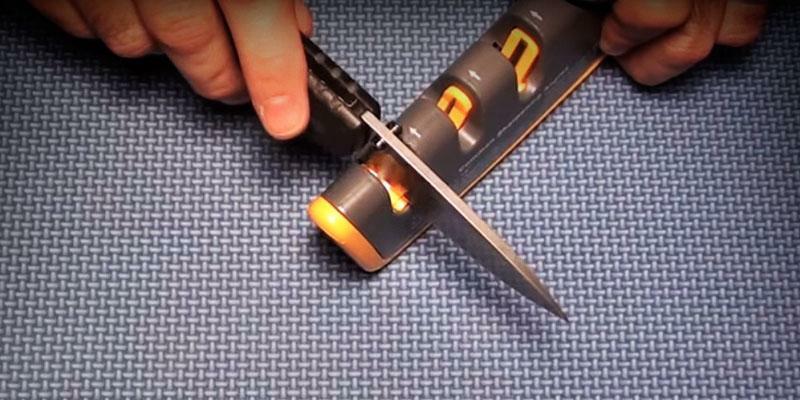 You just need to take some time to master this knife sharpener and make your knives as sharp as swords. So, take your time and all your cutting tools will do a great job. The more knives you whet, the easier it will be to pick the right sharpening angle. Nonetheless, this knife sharpener comes with a special guide that will help you whet the knife blade at the right angle. 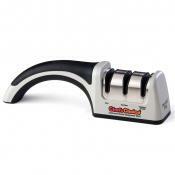 Customers claim that this manual knife sharpener is very versatile and yet, very simple. Thanks to the convenient and compact design, you will be able to sharpen the cutting tools of any sizes and types. 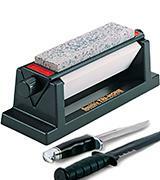 This sharpening system includes 3 Arkansas whetstones of different grits for 3-stage sharpening. The first whetstone provides the rough sharpening and restoration of extremely blunt blades. 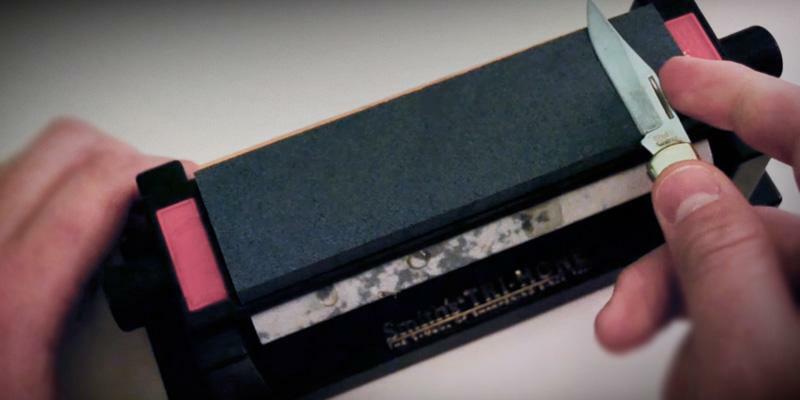 This whetstone removes a large amount of metal from the blade, forming the right shape. The second whetstone removes less metal and is appropriate for straight cutting edges. 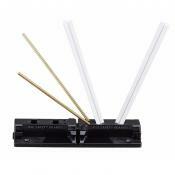 Finally, the third whetstone provides fine sharpening and polishing. 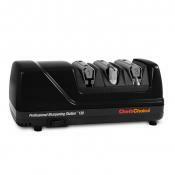 In addition, this knife sharpener comes with the special honing solution to protect both blades and stones. Any cutting tools need care and they must be sharpened one day. We often face this problem when our knives get blunt and, as a result, they cut meat, vegetables, etc. poorly. 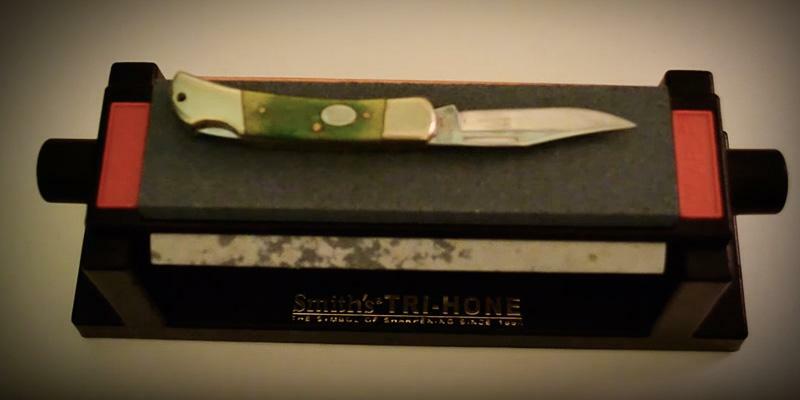 Moreover, you may have various camping, hunting or cooking knives that require rejuvenation. Thus, you will need a good knife sharpener. Some knife sharpeners require certain experience while others are quite easy to use. 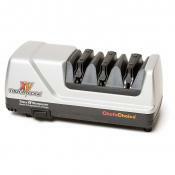 Our knife sharpener review will help you choose the best model according to your needs. 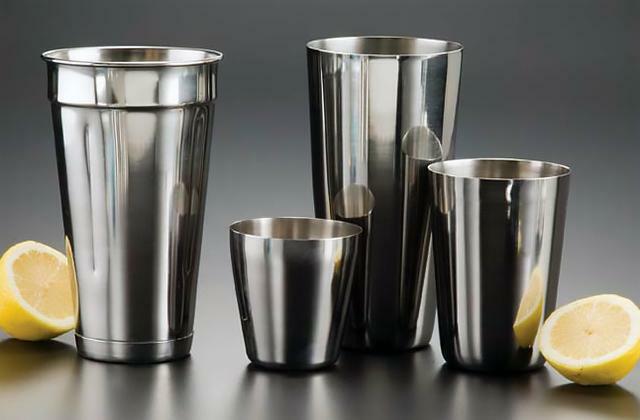 Furthermore, you may need such a useful device as kitchen and food scale or electric can opener in your kitchen. First of all, you need to pay attention to the type and features of a knife sharpener. There are several types of knife sharpeners. Electric and mechanical knife sharpeners, as well as whetstone models, are good for everyday use. Electric sharpeners usually have a trapezoid or rectangular body with several grooves for blade sharpening. Each groove includes disks that are made of various abrasive materials. The discs rotate, thereby whetting and polishing the blades. 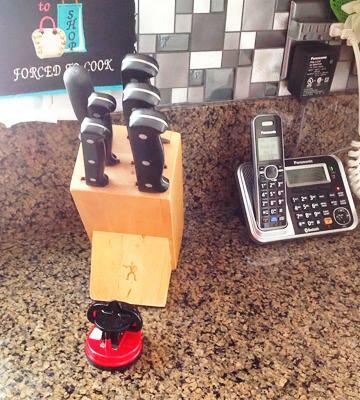 As customers claim, such knife sharpeners are very easy in use. But they should stand on a table firmly. Moreover, some knife sharpeners collect metal filings left after the sharpening. This beneficial option will really save your time! Mechanical (manual) knife sharpeners have also got a wide range of options: replaceable abrasive stones, adjustable sharpening angle, etc. 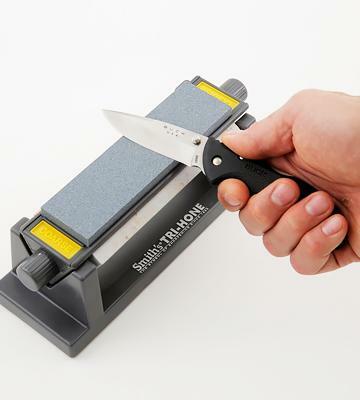 Mechanical knife sharpeners are great space-savers and can be used even during campings or trips. However, you need to get the hang of using such sharpeners. 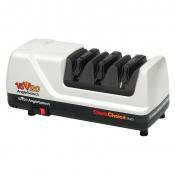 Thanks to convenient handles and rubber feet, these sharpeners will not slip out of your hands. As for the whetstones, they have been used to sharpen the knives for ages. Naturally, their shape is being changed over time. 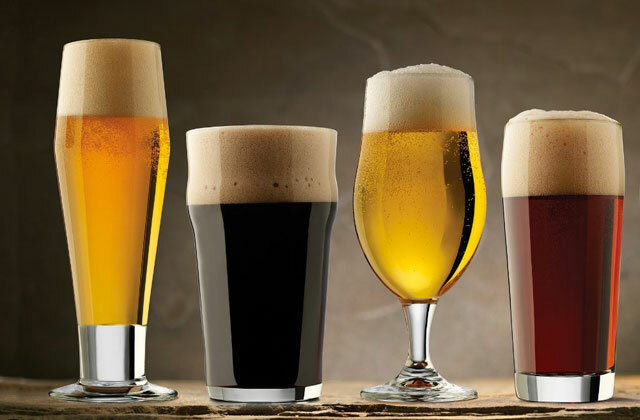 They may look like a bar or disc. Some of them are designed for sharpening while others are developed for polishing and honing. The quality of sharpening with whetstones completely depends on your skills. However, the whetstone knife sharpeners are considered to be the most unpretentious appliances. 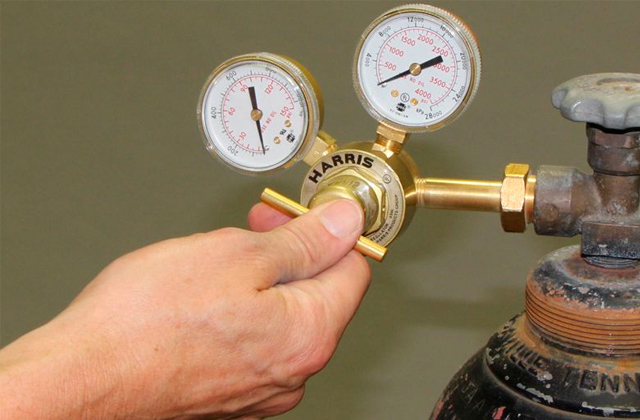 What is more, the measuring marks and other helpful tips will facilitate the use. The sharpening angle determines the quality of sharpening. It is advised to keep the sharpening angle preset by a manufacturer. Furthermore, be mindful of the material and purpose of your knife so as to extend its life. The sharpening angle of 15°-22° is believed to be suitable for kitchen knives while 22°-30° angle is perfect for grinding hunting and multi-purpose knives. You will also find some knife sharpeners with an adjustable sharpening angle in our review. The adjustment of the sharpening angle is a quite important feature. 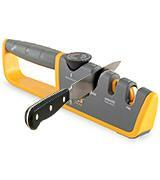 Just imagine, you can change the angle of sharpening anytime! But keep in mind that the less it is, the sharper and more fragile the blade will be. The big sharpening angle is typical for heavy-duty knives made of high-strength steel (for example, meat cleavers or bone choppers). The number of sharpening stages depends on the material and condition of your knife. The whetting of metal knives includes the following stages. At the first stage, the rough sharpening eliminates the damages and defects. At this stage, carbide is usually used as an abrasive material. The second stage involves the polishing and refinement carried out by ceramic whetstones or Arkansas stones (the pieces of microcrystalline quartz quarried from open pits in Arkansas State). The blade of your knife becomes smooth and shrill, once this stage is completed. 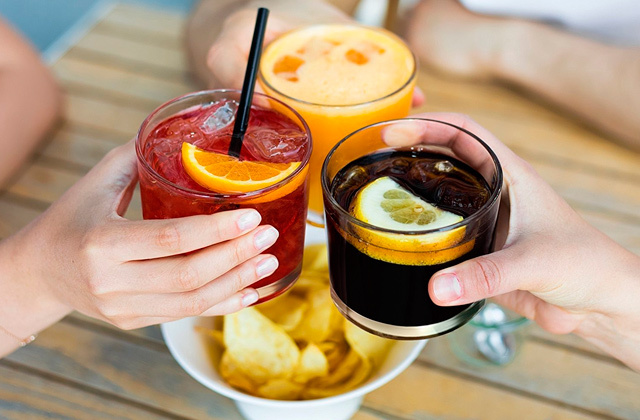 Considering the abrasive material, it may be natural or artificial. The latter is manufactured especially for sharpening needs, and artificial materials are considered to be more durable. But if you have knives with serrated or ceramic blades, you will need a special sharpener for them. 1. 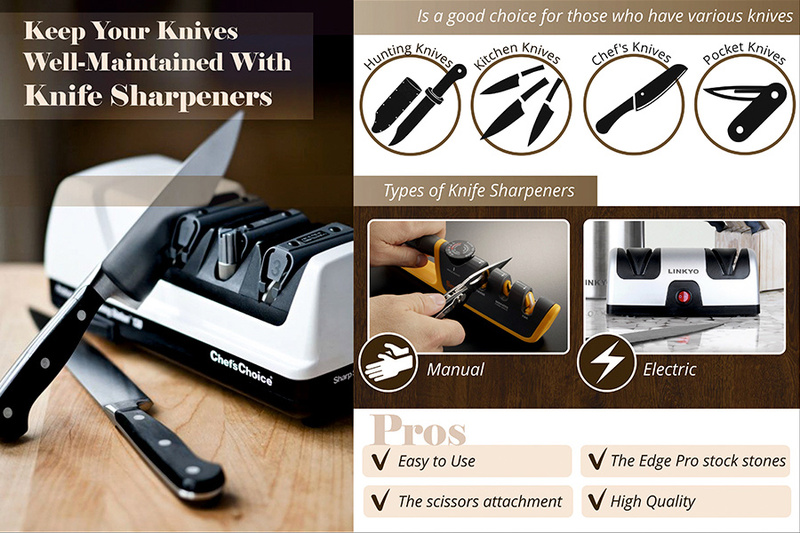 Knife Sharpeners Buying Guide, WebstaurantStore. 2. Christine Gallary This Tool Does Not Actually Sharpen Your Knife. 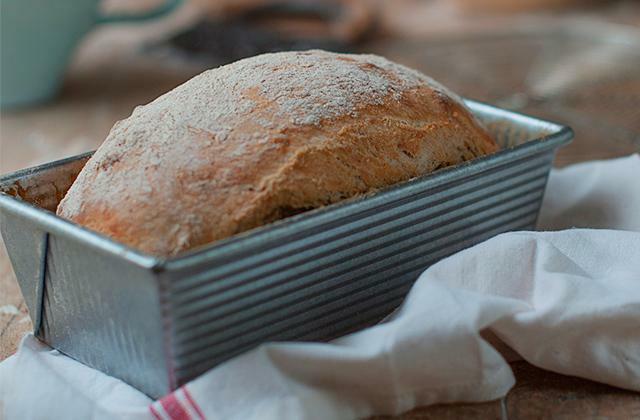 Here's What a Steel Really Does, Kitchn. October 21, 2014. 3. Knife Sharpening, Wikipedia. August 11, 2016. 4. General Knife Sharpening Instructions, KnifeCenter. 5. Cleaver, Wikipedia. July 19, 2016. 6. What is a Knife Sharpener? wiseGEEK. 7. Kelly Burgess How to Buy a Knife Sharpener, ConsumerSearch. November 12, 2015.